10 June 2013, 09:09 a.m. The process flow is simple enough. Your website creates a checkout page from where the user is sent to the payment gateway. On successful/unsuccessful payment, the gateway sends control back to your website on a designated URL. This is the classic Request/Response model used in all payment gateways. 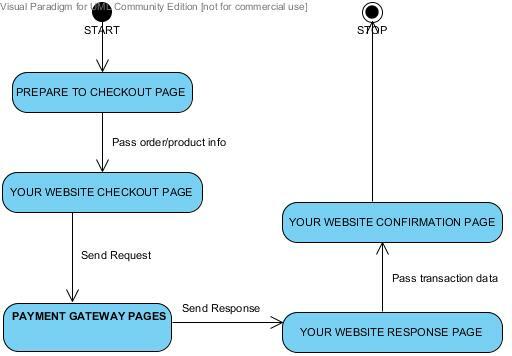 The website sends a payment request to the gateway, the gateway processes the request and sends back a response to the website. Manual Notification . This is the standard method used in most websites. The user clicks on a link to return back to the website after the payment process is over. In this blog, we are only going to look into the Manual Notification method. So lets start off with the sample code implementation. The actual merchant id and secret key should be replaced by actual values. The return url is the same for both the live and test modes in our sample. If you need different urls then you can setup two urls – one for test mode and one for live mode. The merchant id and Secret Key for the test mode is predefined by ATOS SIPS and cannot be changed. The Secret Key is the string which is used to generate a SHA256 cipher string . More on this later in this blog. <%@ Page Language="C#" AutoEventWireup="true" debug="true" CodeFile="pgrequest.aspx.cs"
Please click Submit to continue the processing of your transaction. What pgrequest.aspx does is prepare a FORM POST request to be sent to the gateway URL. If you check the hidden form fields, all the relevant information is passed in the DATA field. The format for the DATA field is fixed i.e each name-value pair will be delimited by the vertical bar symbol. Note that the name-value pairs are predefined and you cannot use your own name-value pair. The allowed names are given in the technical specs manual. At around line 039 in the above source, there is a check for localhost. This is a check to be used when running this code from within Visual Studio. In the sample code , we assume the website application name is Jobsite. When run from Visual Studio, the code has to take care of the application name and the port in the URL. The concept of sealing the data is to ensure the integrity of the data when it is received back in the response stage. Sealing is done by appending the secret key to the DATA string , converting it to bytes and then doing a SHA256 cipher. This returns an array of bytes which we convert to hexadecimal code. This hexadecimal code is passed as a hidden field in the FORM POST. In the response page, the seal is again computed and compared with the SEAL passed from this page. The currency code is taken from the currency code list given in their technical specs. 356 used in the sample code stands for Indian Rupees. Euro is 978, USD is 840. Pound is 826. Verify the computed seal value with the passed seal value. If the above two checks pass then the transaction is considered valid . One important point to note here is in pgresponse.aspx the page is redirecting to another page called JSPaymentResponse.aspx . The name of this page is not important – you can use any page of your liking. JSPaymentResponse.aspx is the page which the user will see as the confirmation page. It will show the details of the transaction he made. The reason why we do not let the user see all the details in pgresponse.aspx is because then if the user refreshes the page by purpose or accidentally, the transaction will again be passed into the gateway page and it will generate an error. So we pass all the data to another page, whose job is to only show the confirmation details. On that page, even if the user presses refresh, it will simply show the details again, without trying to execute the gateway page again. 19 Aug 2013, 7:50 a.m. Thank you for the article, you made it all clear and understandable. For several years now I use this Internet Payment Gateway for my business and now I fully realize how it really works for me. Thank again, you've done a great job!